Many of you have heard the question, “What would you do if you knew you could not fail?” But have you ever really thought that through? What would you do? What dream do you have that you would ‘go for’ if you absolutely knew that you would make it? Now, let’s talk about what is holding you back. As a coach, I have to get to the root of the problem. The issue here is not that you can’t, it’s that you won’t. Is that right? And why won’t you try? Why won’t you step out? I have found that the most common reason across the board is simply fear - fear of the unknown, fear of failure, fear of what people will say, or fear of being hurt. Today, I want to tell you about these four fears you must get past before you can move toward your purpose. My goal is that you will recognize yourself in one of these areas of fear, that you will understand what is holding you back, and that you will break the cycle in your mind of wishing and move into doing. See, it all comes back to your mindset. Your success hinges on your thoughts and the messages you are telling yourself. If you want to change your life, start by changing your mindset. And today, start by changing the mindset of fear. Fear #1 is fear of the unknown. When you talk about your dream, you may hear yourself say, “I’ve never done this before,” or “this is completely outside of my comfort zone.” Fear of the unknown is huge. Many people have serious concerns about venturing into new places and being among people they do not know. We are all creatures of habit. When you go to the grocery store, the gym, or the church, do you park in the same location every time? When you are invited to a social event, would you go alone, or is it important to you to have your spouse or a friend with you? Fear of the unknown can hold you back from realizing a dream or a goal. The world is large and often you will need to expand your borders. Think of the most important person in your life. Where did you meet? Most likely they did not walk up to your front door. At least one of you was in a location or situation with unfamiliar people and perhaps new surroundings. Look at the benefit your life has gained by expanding your borders that day. What is more important to you? Staying where you are comfortable or setting out on a lifetime adventure? Fear #2 is the fear of failure. Most people are afraid of failure and the disappointment that accompanies it. The pain of failure is often crippling and the weight of criticism is destructive. This is why so many people settle for mundane lives that bring them no fulfillment. Instead of facing the possible embarrassment of making a public mistake, they accept the runner-up trophy for a safe and predictable existence that takes them nowhere near their goals. All of us have failed at something in our lives. All of us have made mistakes. If you have honestly tried to do something meaningful to push your dreams forward, then I commend you, because you have already distinguished yourself. You have already set yourself apart from the vast majority of people out there who will never take that critical first step. 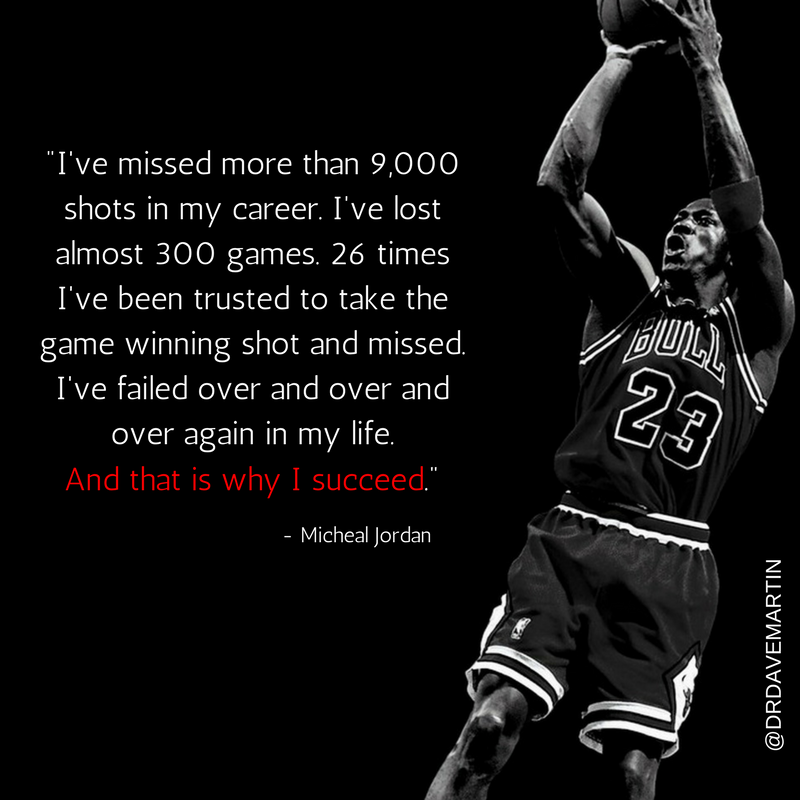 Jordan, like all other great players, knew how to rebound and to shoot again and again until he finally hit the goal. He wouldn’t give up. He wouldn’t go away. He didn’t even pay attention to the cheers or the jeers of the crowd. He just focused on the ball and focused on the rim and kept shooting and rebounding and shooting again until he overcame his misses and did what he was trying to do. He was fearless. Fear #3 is the fear of criticism, ridicule or rejection. Think about that for a few minutes. Do you truly think the people you love and trust might laugh and belittle you? Would you do the same to them? Is that fear really founded in reality, or is it a monster in the darkness of your imagination? People fear many things when they consider taking that big step into their goals. Perhaps the most dreaded is the fear of criticism. They fear looking foolish in front of other people, especially when those other people have predicted their downfall. They fear rejection. If you are concerned about the criticism or rejection of others, take heart. Don’t be afraid of criticism. Remember the source of the words. The ones who criticize you for having ambitions are people who have fallen short of their own goals in life. They used to dream, but now they live safely in a predictable, average life, because they failed once, and they are afraid to try again. Deep inside they don’t want you to succeed either, because your success would show them up and bring to light their own surrender to fear. They want you to conform to their mediocrity. Don’t conform. Absolutely do not. Ignore the criticism and the pessimism. Instead, do something meaningful, so your life is never so small that you belittle someone from secret resentment and envy. Fear #4 is the fear of getting hurt. You think, “I might get hurt – maybe emotionally, perhaps financially.” Yes, you might. But you might not. Do the benefits outweigh the risks? Would you rather sit immobile, watching others play the game, wishing it was you and wondering what might have been? I will tell you this. If you have set goals and dreams that are worthy of pursuing, you will not reach them without some bumps and bruises. Somewhere along the way, you will be hurt. You will be knocked off your feet, and you will feel real pain. But that does not give you a reason to quit. Instead, it gives you a reason to move on and to move through the trial. Something is indeed worth it. If it’s in your heart and it won’t go away and you can’t find satisfaction until you so something about it, then that dream within your heart is God’s destiny for your life. Don’t expect its achievement to be easy. Rather, expect the battle for that worthy prize to be difficult and lengthy. Expect opposition. Expect criticism. But don’t let that deter you, discourage you or daunt you. Go for it. Do something about that business opportunity that’s in front of you. Pursue that college degree if it will help you get where you want to go. Write that book you’ve always wanted to write. Record that song. Launch that business. Quit talking about it, quit worrying about it, quit thinking about it, and just do it. The world rewards action, not thought. So, adjust your mindset, set your fears aside, and take action!